As a dog lover, you want the best for your pet. Finding the right dog food to keep your pup happy and healthy is an important decision. Many companies produce a variety of flavors and styles of dog food to meet your dog’s needs. In general, dog foods are produced to be a complete diet for your pet. That includes dry kibble, moist canned food, and even frozen items. Many factors are important in selecting your dog’s food including your budget, your dog’s preferences, and the breed, size, and age of him or her. Today, there are also multiple venues for purchasing dog food. Like many other products, dog food is frequently less expensive when purchased online. DO look for specific animal protein as the first ingredient on the list. Main ingredients are always listed first on any food label, so you want to see something like chicken or beef as the first item. DO look for beef, chicken or lamb meal as the next ingredient on the list, especially if fresh or frozen meat is listed first. The percent of protein by weight is much higher in meals and lower in fresh and frozen meats, which contain more water. DO look for whole foods after the proteins. The majority of fruits, vegetables and grains listed should not be noted as fractions but as whole foods. The less processed these foods are, the more nutrition they will contain. DO look for a freshness date that is between six to 12 months away. This will alert you to the fact that the dog food was recently manufactured and contains little or no preservatives. DON’T buy dog food that is made from meat or chicken by-products, which are typically not cared for as well by suppliers. DON’T buy dog food with vague ingredients like meat meal or animal fat. When manufacturers do not specify beef, chicken or lamb fat, they may be using low-quality, highly processed waste as animal fats. DON’T accept questionable ingredients like artificial preservatives, colors, flavoring and sweeteners. These are typically an assortment of chemicals to make low quality dog food less expensive and more palatable for your dog. The nutritional value is much lower and the synthetic nature of these ingredients may cause long-term health issues. Today, you can buy just about anything online, and that includes everything for your dog – like their food. 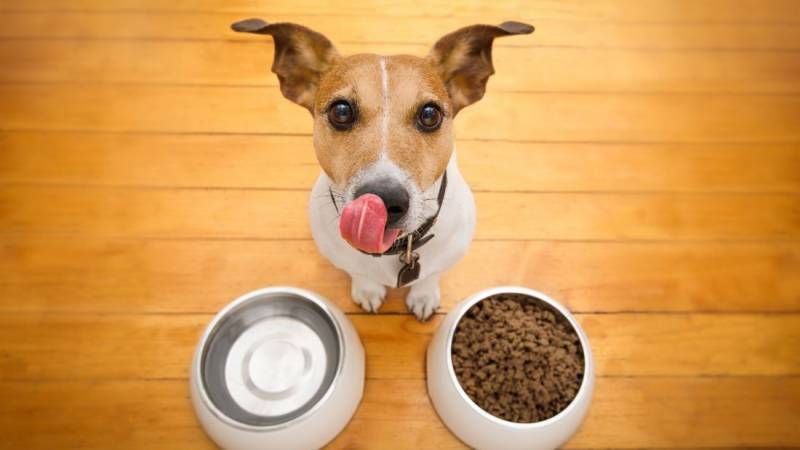 Although some of the benefits of buying online are the same for other products, such as greater variety, lower cost, and many different size and packaging options, there are some benefits that are specific to dog food. If you live in a smaller town, you may have very limited dog food choices at your local markets. It can be cost prohibitive for retail stores to carry too many varieties, which means you will only be able to choose from the biggest name brands at a local brick and mortar store. Even if you live in a larger city, you may need to travel a significant distance to find a specialty pet store that sells a particular brand of dog food you are seeking. Shopping online eliminates this problem because dog food manufacturers can easily ship to anywhere in the country, providing you with access to gourmet, nutritionally advanced, specialty products. If you have a dog allergic to certain ingredients or a pet with special dietary needs, online shopping can provide a much wider selection of foods for your pet. By ordering online, you can eliminate writing “dog food” on your weekly shopping list. Most major online sellers allow you to schedule deliveries on a weekly or monthly basis, ensuring that you always have a steady supply of dog food arriving when you need it. This can also help you manage your dog’s food budget by knowing exactly how much you will spend each month. Just as stores cannot afford to stock an endless supply of dog food brands, they also cannot offer a multitude of packaging sizes. Stores must sell what is the typical package size in order to maximize their profits. When you purchase dog food online, however, you can save money by purchasing bulk quantities. Often, the larger the quantity, the more likely you are to receive both a price and a shipping discount. This can mean significant savings, especially if you have multiple dogs. In order to make the best purchasing decision for you and your pet, you will have to consider a wide range of factors. Although cost is certainly important, you will need to weigh the ingredients, quality and tastiness of various dog food choices against the age, breed, health and temperament of your pet. Shipping costs may be high and eat away the savings gained from online purchasing. However, if the dog food you need is a specialty brand that is not accessible anywhere except online, then the cost is not as critical. Try looking at numerous sites to see if there are coupons available or free shipping offered. Amazon.com. This site allows you to narrow your search by age of your dog, package size, ingredients, flavors, health focus and price. Shipping prices may vary and different options are available. Chewy.com. This site allows you to shop by pet or brand name. They offer special deals, discounts, and provide free 1-2-day shipping for orders over $49. The site also offers an auto reorder feature. Wag.com. This site has relocated its home Amazon. You will be redirected to the amazon.com site. Dog.com. This site allows you to sort dog food products by breed, size, brand name, price, special health benefit, dietary restrictions or protein source. They offer special deals, discounts and also have an auto-ship option. Petflow.com. This site offers free shipping for orders over $49, and has an automatic reorder option. You can search by brand, special health condition, life stage, form of food, size, ingredients and allergens. Petfooddirect.com. This site allows you to search by brand, discount amount, form, health condition, protein source, breed and size. In the end, selecting the right dog food for your pet is an important one. Taking time to research and consider all the critical factors including the breed, size and age of your dog as well as the price, ingredients, taste and form of the dog food, will help you make the best decision. Buying your dog food online is a good option, giving you greater selection in terms of brands and formulas as well as packaging and price.